The gun selection system from the first two Bioshock games is back for Bioshock Infinite's upcoming DLC. 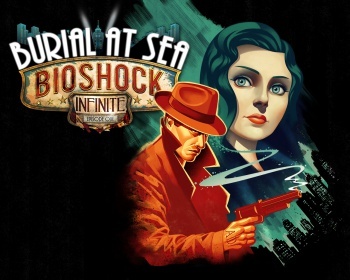 Undersea dystopia Rapture won't be the only element returning to the Bioshock franchise with the upcoming Burial at Sea episodes. In a recent Reddit AMA, level designer Andres Gonzalez revealed the reintroduction of the weapon wheel, along with plans for other new features. "I can tell you that for Burial at Sea: Episode 1 we added new weapon, a new Plasmid, new Gear, Tears and we brought back the weapon wheel," he said. Bioshock and Bioshock 2 both made use of the weapon wheel to allow players to pause the game and select from one of several different guns stockpiled in their inventory. Bioshock Infinite changed the formula by only allowing players to carry two guns at a time. Gonzalez was joined in the AMA by series creator Ken Levine, and you can learn some more details about the game from his answers here. While a concrete release date has not yet been set for the first of Burial at Sea's two episodes, Levine said he expected it to be out "before the holidays and hopefully fairly soon."